For other uses, see Cist (disambiguation). A cist (/ˈsɪst/ or /ˈkɪst/; also kist /ˈkɪst/; from Greek: κίστη or Germanic Kiste) is a small stone-built coffin-like box or ossuary used to hold the bodies of the dead. Examples can be found across Europe and in the Middle East. A cist may have been associated with other monuments, perhaps under a cairn or long barrow. Several cists are sometimes found close together within the same cairn or barrow. 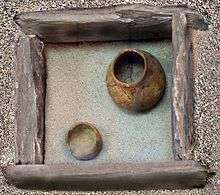 Often ornaments have been found within an excavated cist, indicating the wealth or prominence of the interred individual. ↑ Houghton Mifflin (2000). The American Heritage Dictionary of the English Language (4th ed.). Boston and New York: Houghton Mifflin. p. 339. ISBN 978-0-395-82517-4. ↑ Merriam-Webster Unabridged (MWU). (Online subscription-based reference service of Merriam-Webster, based on Webster's Third New International Dictionary, Unabridged. Merriam-Webster, 2002.) Headword cist. Accessed 2007-12-11. Wikimedia Commons has media related to Cist graves.